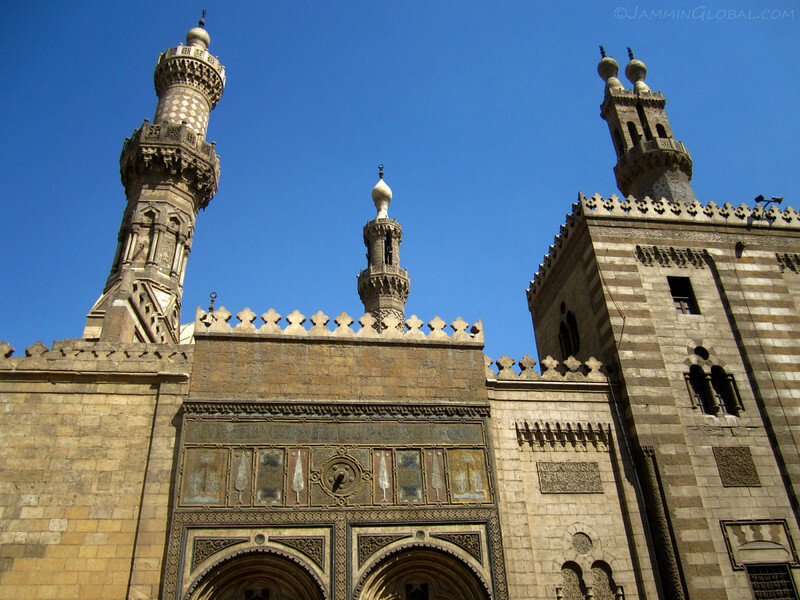 Cairo, known as al-Qahira in Arabic, is not only the capital of Egypt, but is considered the center of all Arabic politics and culture. That’s partly due to its long existence (since the 10th century) and also due to its massive size. It’s the largest metropolitan area in Africa and with only desert in its way, urban sprawl is bound to keep that title in Cairo. Having a strong cultural heritage but being thrust into the modern world lends the city to have many different faces. In my two weeks here, I managed to experience a few of those different facets, ranging from age-old souks to modern clubs to dune-bashing and pyramid-gawking. This first installment covers the first five days. 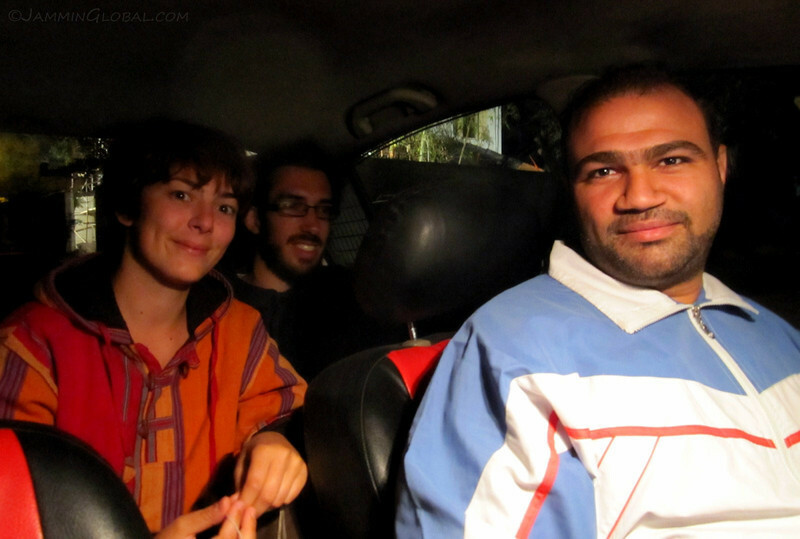 I stayed with Fabrice in the affluent neighborhood of Maadi, which is south of city center and his place is well connected by Cairo’s Metro system. 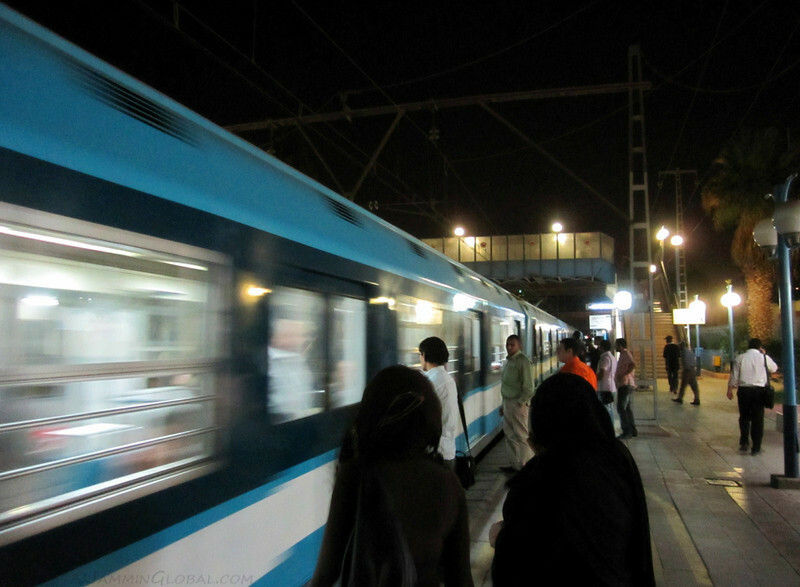 It is the first and only metro system on the African continent and I was very pleased with how efficiently it ran, reflecting Egypt’s status as an emerging economy. The fare for a single ride cost LE 1.00 ($0.18). Clock tower at the railway station with Eastern Arabic Numerals. I managed to learn them pretty quickly and could draw signs on my palm when buying something from a street vendor. 1 is pretty straightforward; 2 has two horns; 3 has three horns; then 4 is tricky, it’s a reverse three; 5 looks like a zero; 6 is again tricky, looking like a seven; 7 and 8 go together; 9 is straightforward; 10 is one and zero, which is a dot; 11 is two ones and 12 is one and a two. Simple. 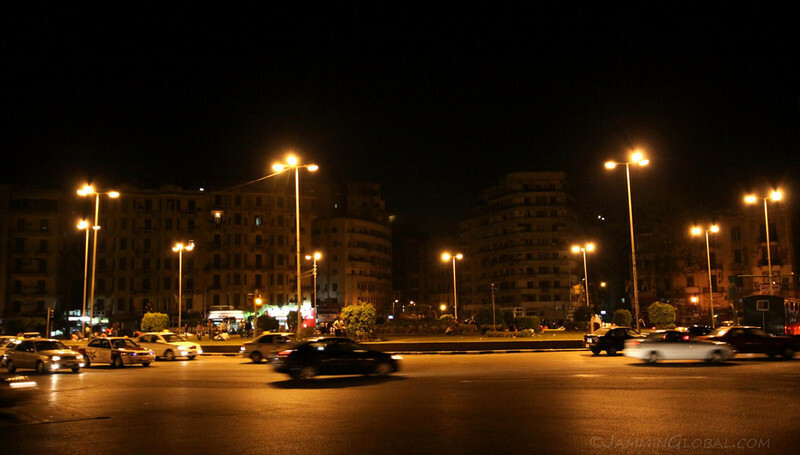 Yeah, I know it’s pretty late in the evening, but shops are open long into the night in Cairo. 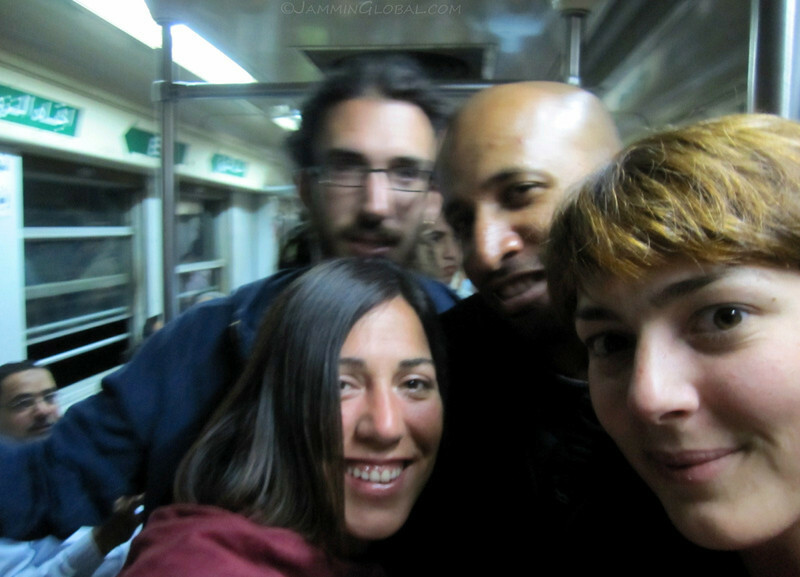 I was heading downtown with these three other CouchSurfers who were also staying with Fabrice: Tiph and Flavien from France and Candela from Spain. They are all studying together in Athens and just came down for a week-long break. They arrived here just as the street protests were escalating in Athens due to the imposition of austerity measures by the government in fear of defaulting on their loans. Since Candela’s English wasn’t that proficient, we all spoke in Spanish, which helped me keep in touch with the language I learned through my many months in Latin America and lack of practice is what makes one forget a certain skill. 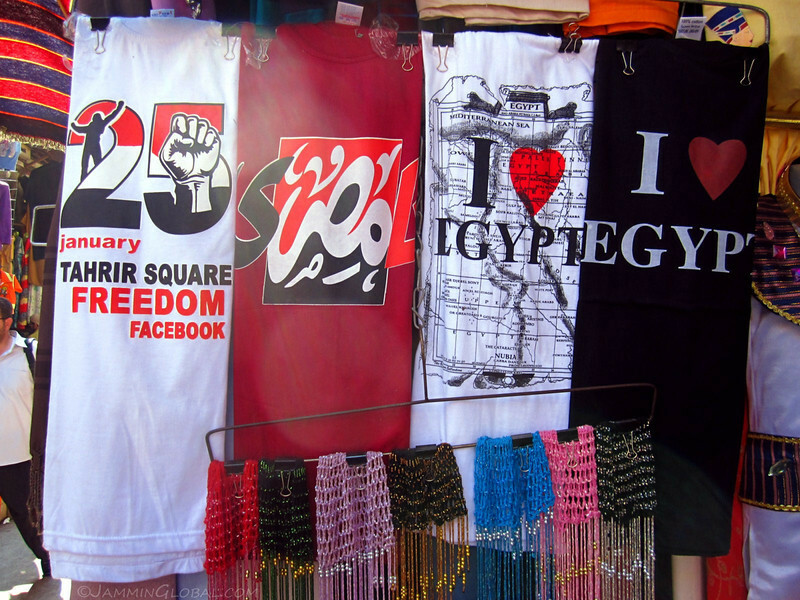 …Tahrir Square, the focal point of the Egyptian Revolution. 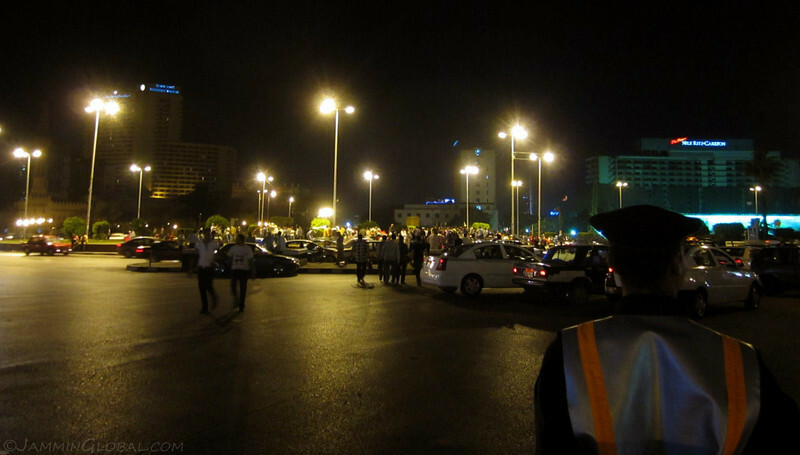 It was here that three months ago, Egyptians of all strata in society gathered and demanded that their dictator step down. With the army on the people’s side, Mubarak had no choice but to realize his time was up. I felt nervous and excited to be so close to this hot bed of political activism. Seeing the pictures on TV and then standing here and understanding the significance of this location reminded me of the opportunity that overland travel presents, namely, to be living in history. 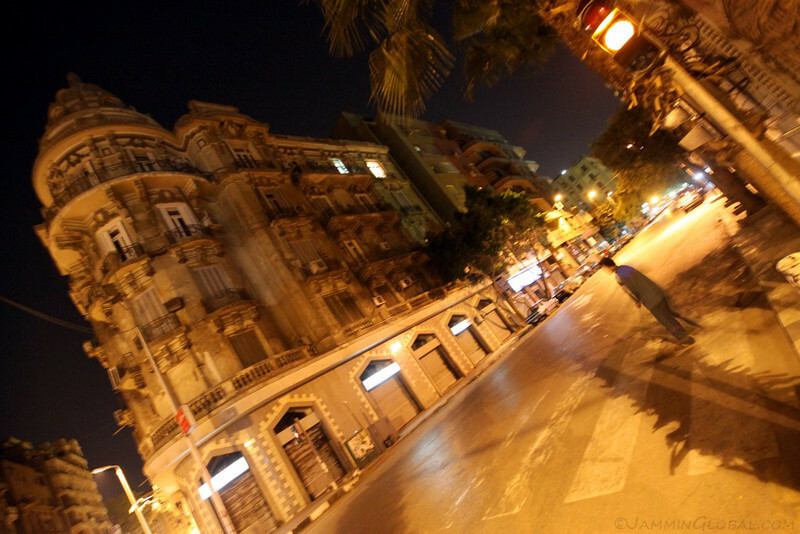 We walked down one of the side streets from Tahrir Square, looking for a place to eat dinner at 1 am. The orange glow from the street lights highlighted the French influences in this building. We found some comfort food, Kosheri, served at the chain restaurant Tom and Basal. 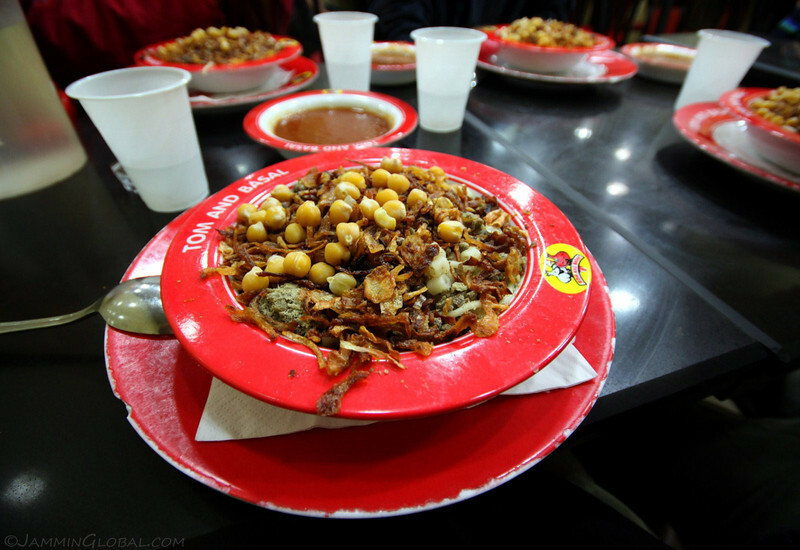 Here it was served with some tomato sauce to drizzle on top of the fried onions, chickpeas, rice, lentils and macaroni mash up. 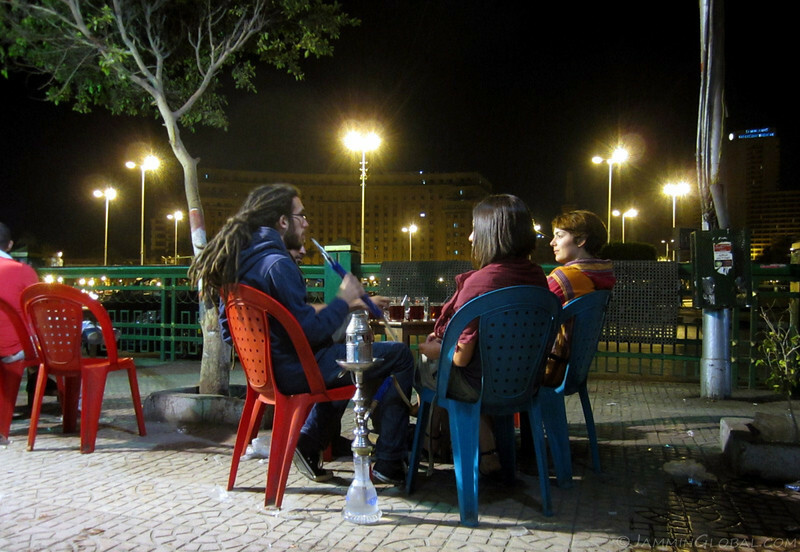 After dinner, we sat at this street café overlooking Tahrir Square, having some sweet tea and smoking shisha through a hookah, which I might add originated in India in the 16th century. 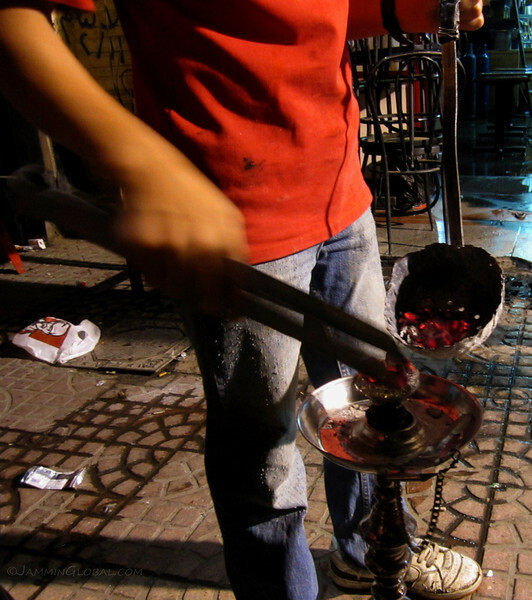 Refreshing the hot coals that heat up the shisha (flavored tobacco molasses) with its smoke being drawn down into the water chamber, which acts as a filter for the smoke. In the time we were there, people started gathering in the square and it was evident that things were not yet fully back to normal in Egypt. The people had realized the power that they hold in numbers against authority and following the stepping down of Mubarak, Egyptians repeatedly came back to Tahrir to voice their demands to the military council in charge of the transition. By the middle of May, Egyptians were getting restless with the slow pace of the council’s ability to bring Mubarak and his family to trial, accused of siphoning off billions of dollars during his thirty years in power. The café closed down around 2 am and I like this shot for the depth added by the reflection in the standing water. 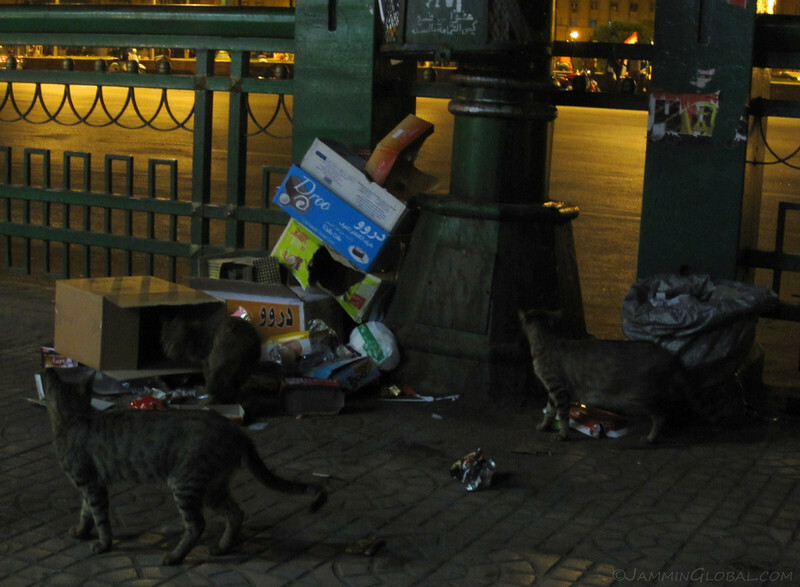 Cats, this time three of them, all absorbed in their own social drama, which looked like it mainly revolved around territory and who had first claim to rummage through the garbage. Candela was looking through my camera and commented that I mainly took pictures of food, roads and cats. Guilty. 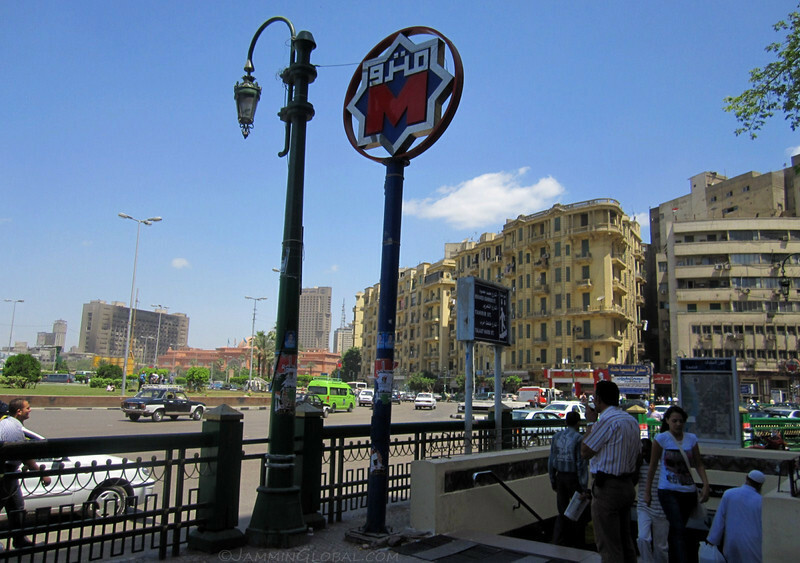 The trains had stopped running by now and Fabrice told us not to pay more than LE 20 ($3.64) for a taxi back to Maadi. This guy was offering to take us back for only LE 10. It sounded suspicious, but he confirmed the price. We got in and as I usually do with cabbies, I started chatting him up. I had just finished my Michel Thomas Arabic language lessons and with the few phrases that I remembered, I struck up a simple conversation with him. He was eager to learn English and me, Arabic. We had a jolly old time and when we arrived, as I offered to pay him, he refused to accept and motioned that he was thankful for the conversation. Wow, a nice first impression of Cairennes (people of Cairo). 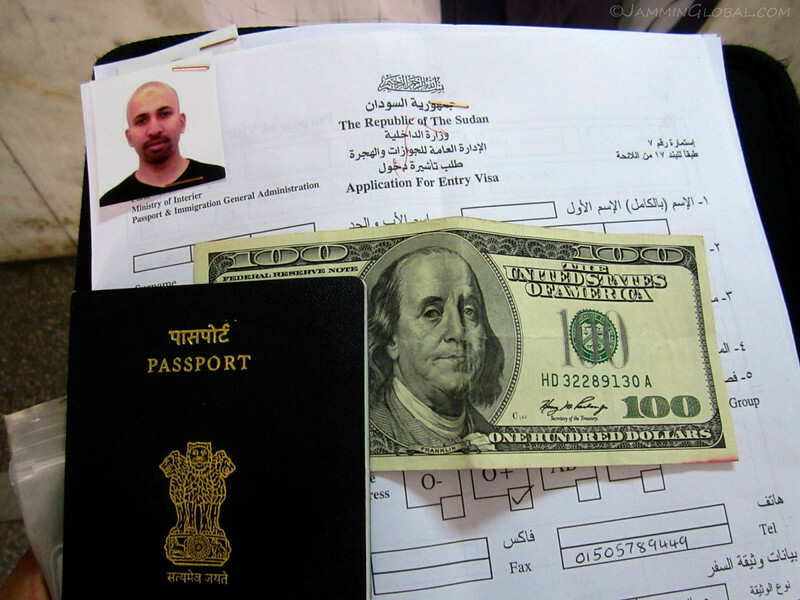 The next morning, I headed back into the city to take care of some trip administration: visa for Sudan. When overlanding, your top priority becomes visas, especially when traveling on an Indian passport. But I think from now on, things are going to be easier for an Indian passport, such as the good relations between India and Sudan. I grabbed some fresh bread for a breakfast on the go; seasoned with pollution can’t be that bad. I wonder how he prevents people grabbing a fresh eesh baladi (Egyptian flat bread) and running off, especially guys on horse carriages. 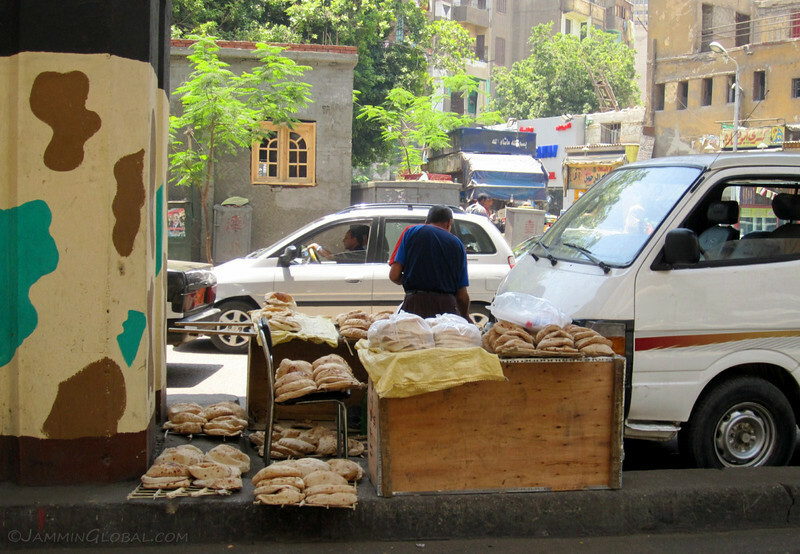 Bread is baked first thing in the morning and then these rapid deliveries bring them to various outlets around the city. He’s part of the food supply chain and I guess the Qur’an ensures that no one steals from him. 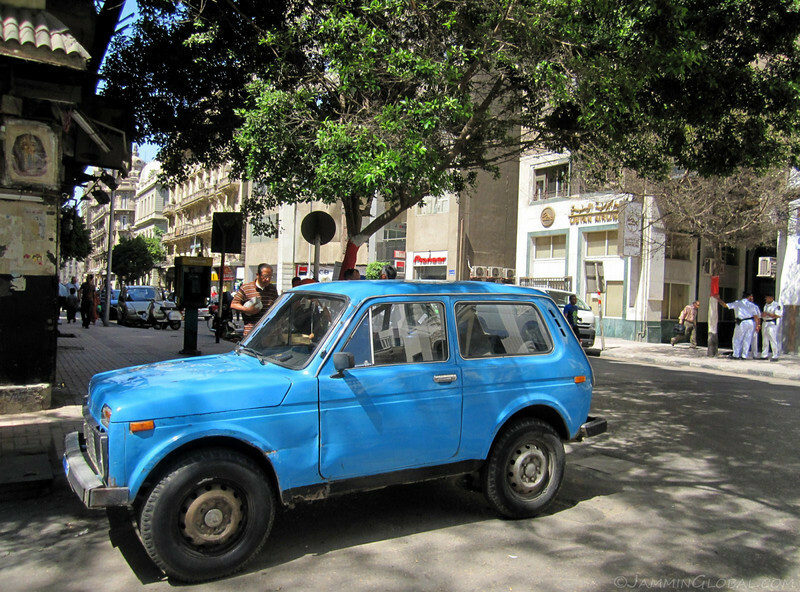 Some company for Manuel’s Lada Niva in Alex. 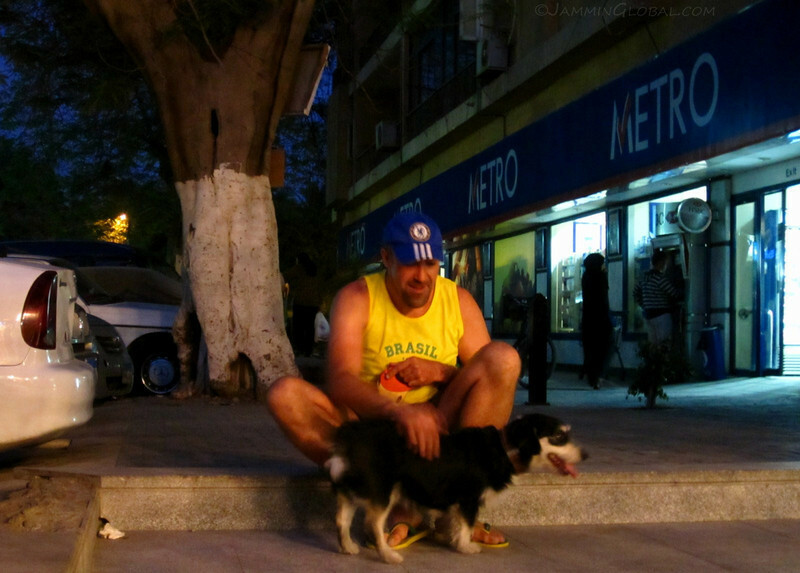 I had to capture this garish bright blue against the predominantly earth tones of Cairo. I love the beefy look. 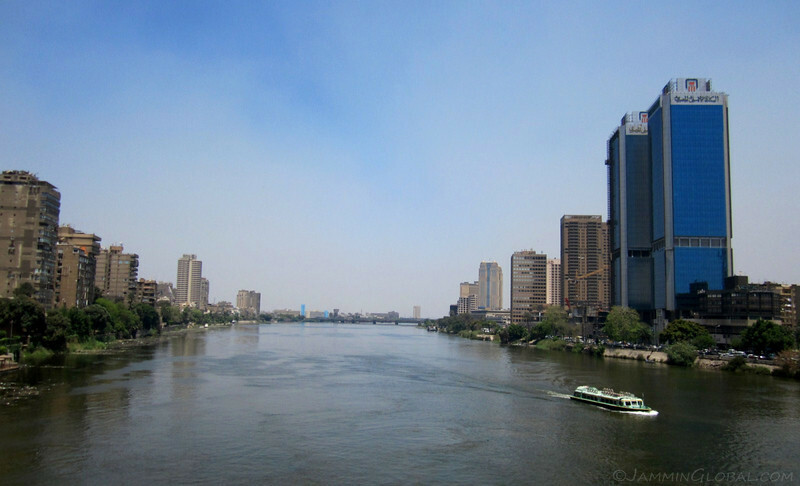 Downtown Cairo, with its lifeblood, the Nile flowing through it. Modern eastern Cairo on the right looking over at Zamalek, an older, affluent part of the city from the 15th May Bridge. After traveling more than 6,650 km (4,132 mi) from its sources, the longest river in the world has lost the battle with man and can’t purge his sewage quick enough. From here, the main trunk spreads out over the Nile Delta, a vast, fertile land that has fed the people through the eons. However, due to their unsustainable use, the Nile is one of the major rivers in the world that doesn’t flow to the sea some years, which has lead to a loss of Mackerel and other fish in the Mediterranean Sea (since the river delivers nutrients that form the food chain). 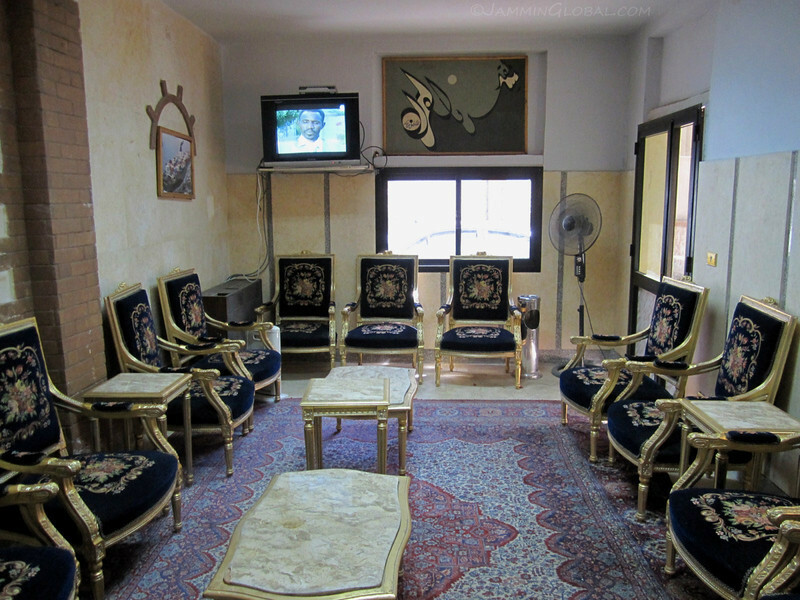 I arrived at the Sudanese embassy in Cairo and initially came to its formal entrance, with the lobby decorated with gold-painted chairs. When I motioned that I needed a visa, I was sent around the compound to the bourgeois entrance. The visa office resembled that of a bus station ticket counter. The most expensive visa so far: one Benjamin to get into the land of the Sudan. The strange thing about this visa is that they require each applicant to get a letter of introduction from their local embassy. This is a very old protocol, from back in the day when bureaucratic formalities were not judged by their efficiency. Some western embassies no longer offer letter of introductions, stating that that’s the purpose of the passport. Something to this effect is also written in my passport, but it just goes to show how much India herself swims in bureaucracy that they did produce letter of introductions, costing another $14. Getting some lunch while my visa was being processed. 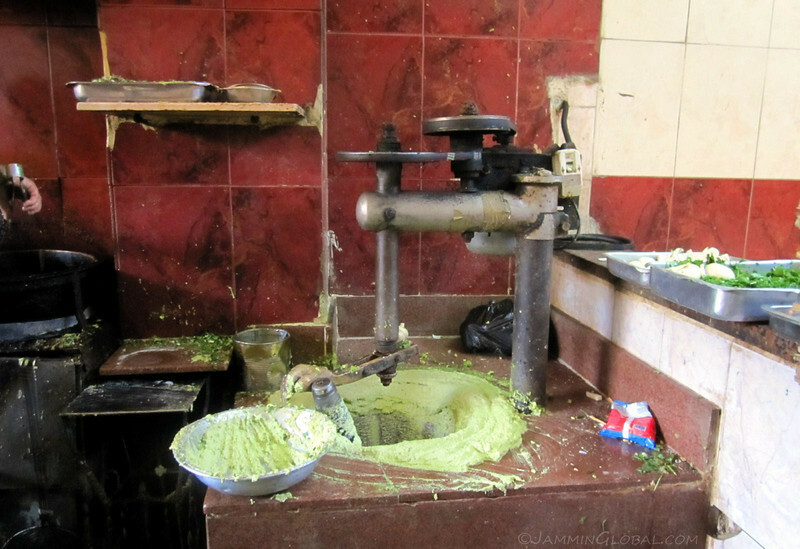 This is a machine to mix the base of falafel: chickpeas or fava beans along with herbs and spices. Note the prosthetic hand on the end of the spindle, which holds the wooden roller. In the name of efficiency, some genius came up with this contraption to replace a real hand. There’re tinkerers everywhere. I got the visa stamped in my passport in 45 minutes and was thrilled to be done with that. With the visa officer singing a Hindi song when he saw my passport, I knew this would be a smooth process. Poor Americans, most of them have a tough time getting in, due to economic sanctions placed on Sudan by the superpower. 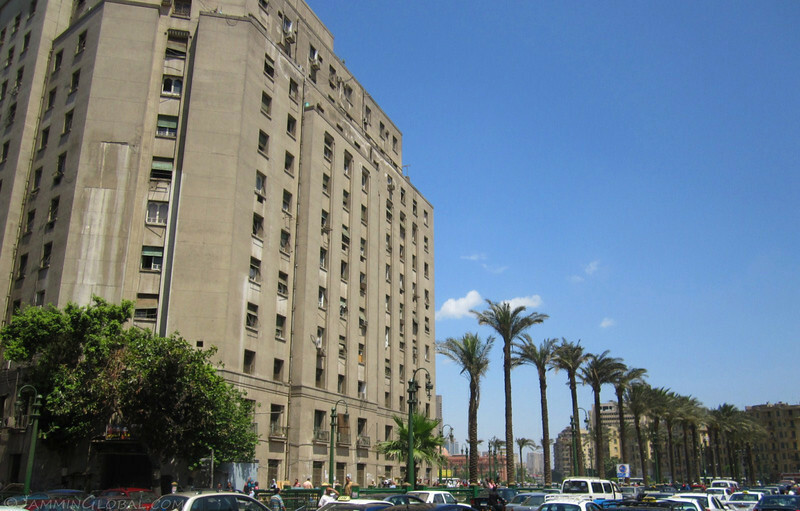 Walking past The Mogamma building, which has been a fixture at Tahrir Square since 1952. It was a gift from the Soviet Union, who were trying to build an ally in Egypt and the Soviet-influence in the architecture is clearly evident. 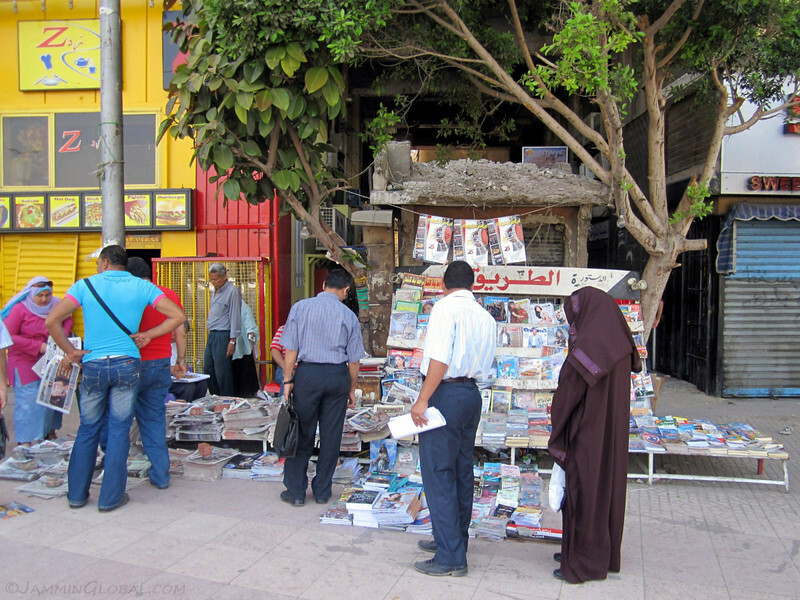 A roadside book shop at Tahrir Square. 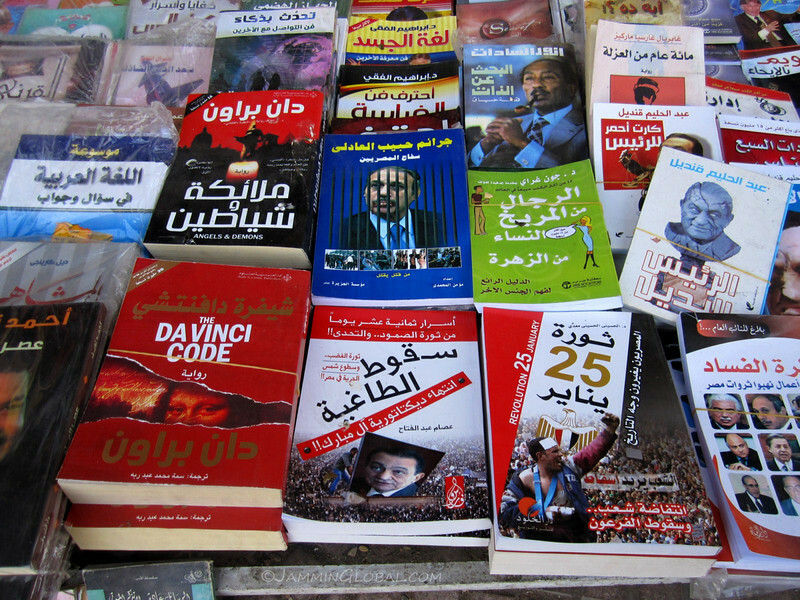 Being placed right next to new books on the January 25th Egyptian Revolution, The Da Vinci Code must still be a bestseller here. 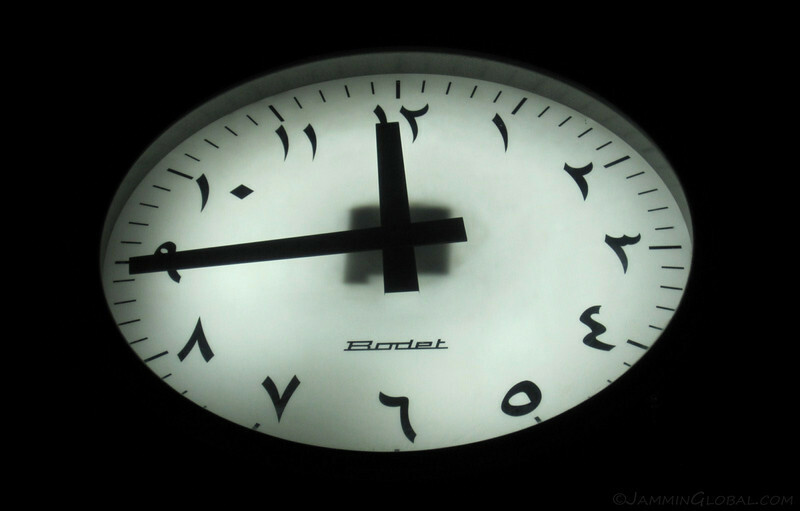 Note that the binding is on the right side, since Arabic script runs right to left. 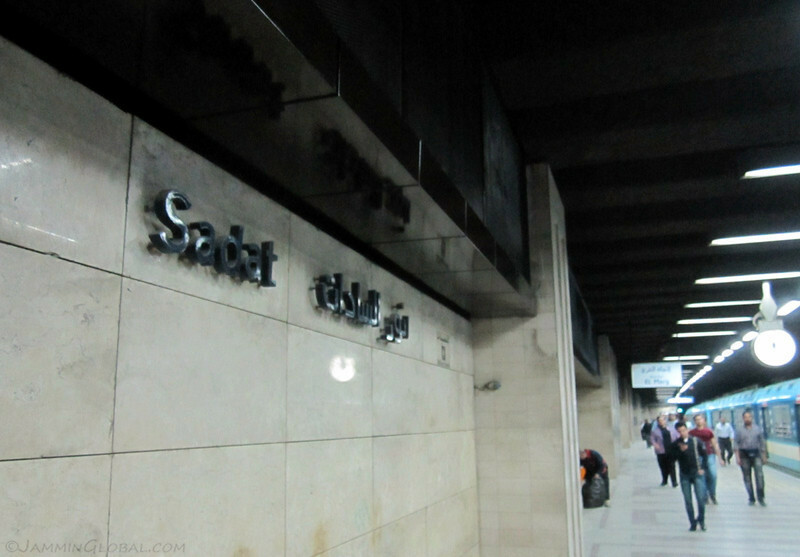 One of many metro entrances at Tahrir square, leading down to Sadat station that occupies most of the roundabout, reminding me of the Charles de Gaulle-Étoile metro station in Paris, under the Arc de Triophme. The café from yesterday is under that yellow building. 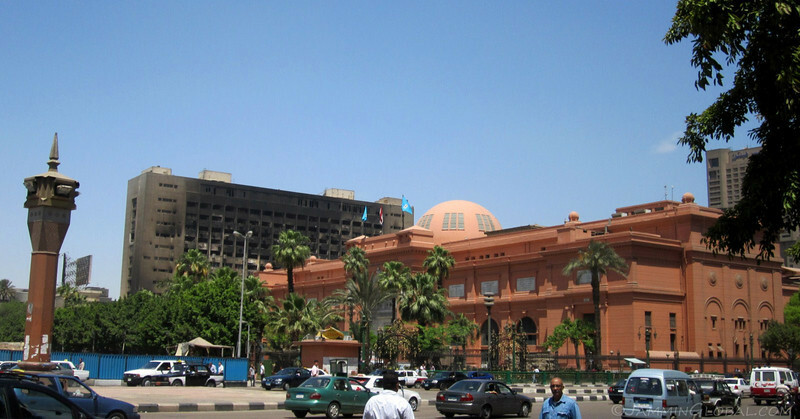 At the other end of Tahrir Square is the mauve-colored Egyptian Museum, housing most of the famous finds from Egypt’s ancient past. Prominently behind it is a scar from the climax of the revolution: the burnt facade of the Interior Ministry. In it were housed records of all the torturing and abuse by Mubarak’s state security police, which kept the dictator in power. When Mubarak stepped down, it signaled the end of the party and records were ordered to be destroyed, especially those that could implicate Mubarak in war crimes. It was set ablaze on February 23 and again on March 22, 2011. As expected, the Interior Ministry blamed the fire on the protestors, who had nothing to do with it. 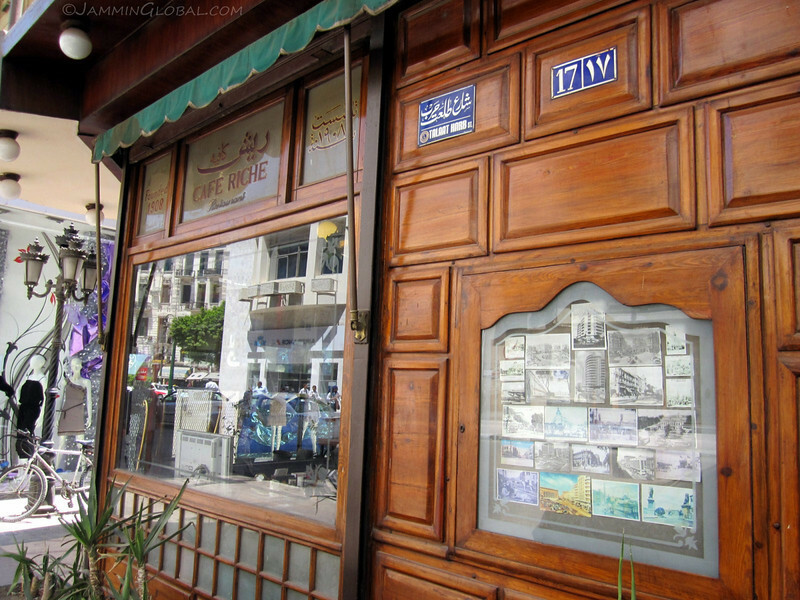 I explored up one of the main veins running from Tahrir Square and came across Café Riche, a long time establishment, steeped in history. It was here that some royals first met along with revolutionaries planning their activities in its basement. 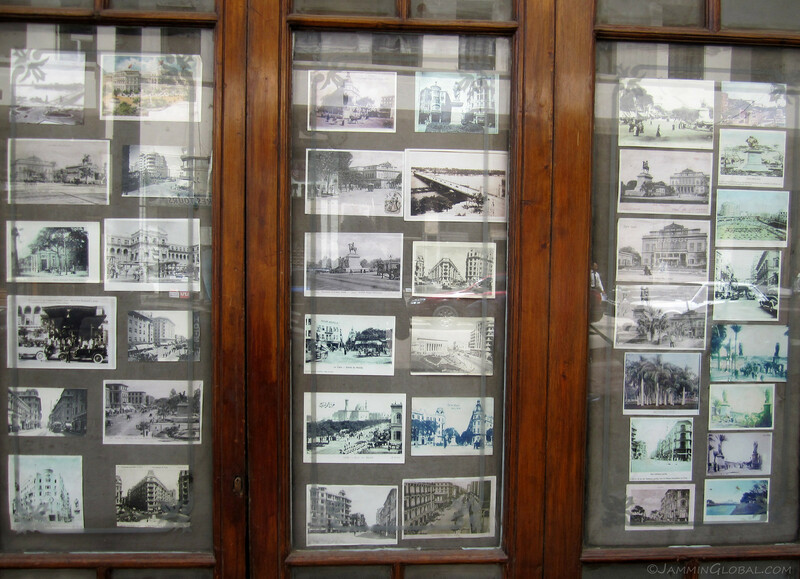 I spent some time going over these photos from the Cairo of the 1930s. It showed a very sophisticated society, resembling that of Paris. Nowadays, there are plenty of flyovers bisecting the cityscape, in the name of appeasing the ever-increasing traffic. Click on it to see a larger version. Café Riche’s prices were too riche for me, so I sat down across the street at Café Groppi, another old time establishment but with more reasonable prices. 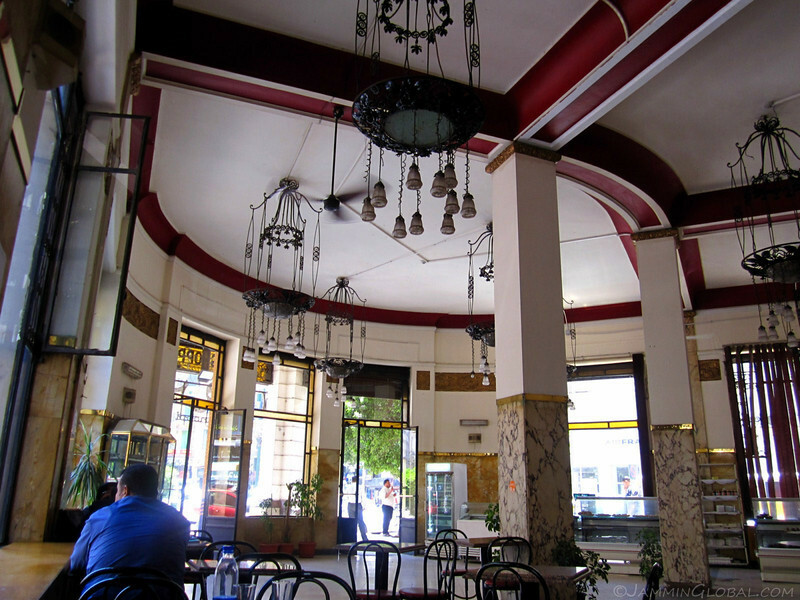 Groppi was also once the center of Cairo’s intellectual scene, but it showed signs of being weathered and felt quite drab. Service was also quite poor, but I was here to soak up the nostalgia and the architecture of this tea and pastry hall that opened in 1891. I imagined the kinds of crowds that would have packed these ahwah’s in the 1920s, just after the Egyptian Revolution of 1919 that lead to the end of British rule and independence in 1922. Along with a pot of tea, I had this super sweet, flaky confectionery, soaked in honey, resembling baklava. I have a few cavities, but I still keep my sweet tooth happy with a heavy dose of sugar every once in a while. 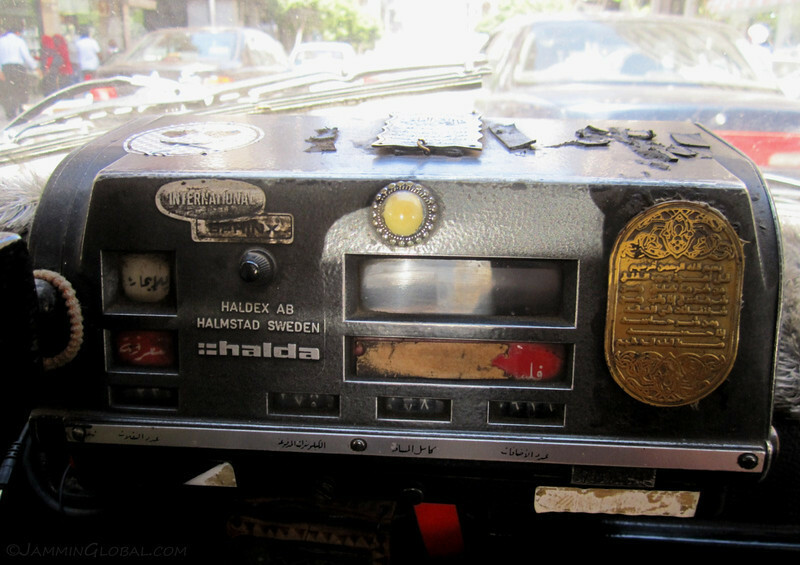 Taxis in Cairo are pretty cheap and I noticed this ancient taxi meter from Halda in Sweden (who made pocket watches) on my way over to Islamic Cairo. If it works, why bother upgrading? I’m all for old mechanical devices surviving into this age of electronics. 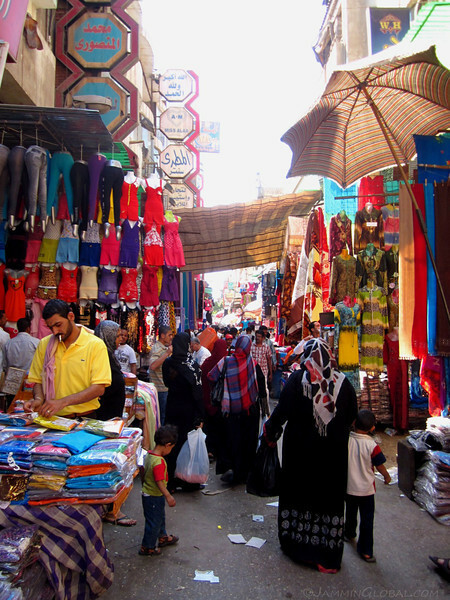 …Khan el-Khalili, the major souk (market place) of Cairo where almost anything can be found. I lost my sun hat in the subway and was told I could find one here and managed to do so. 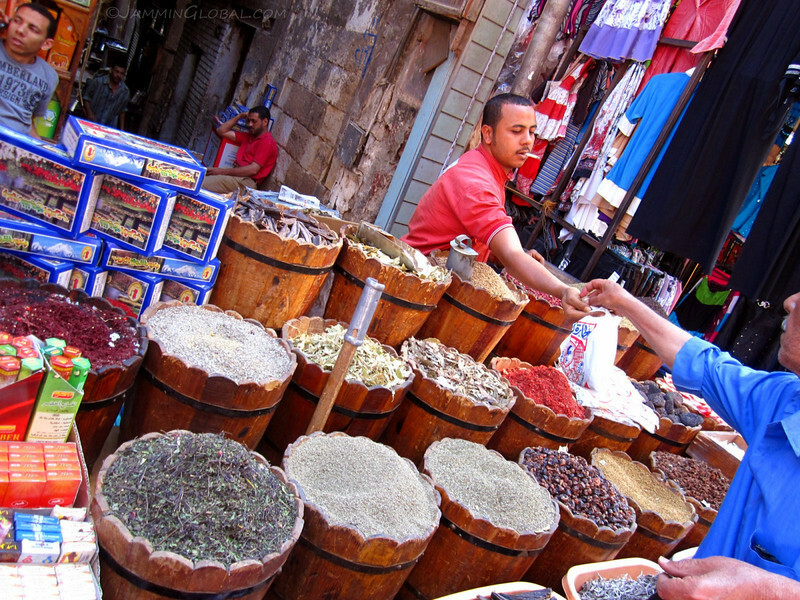 The souk has been a center of trade since 1382, allowing sufficient time for vendors to develop their hawking skills, who are quite aggressive. 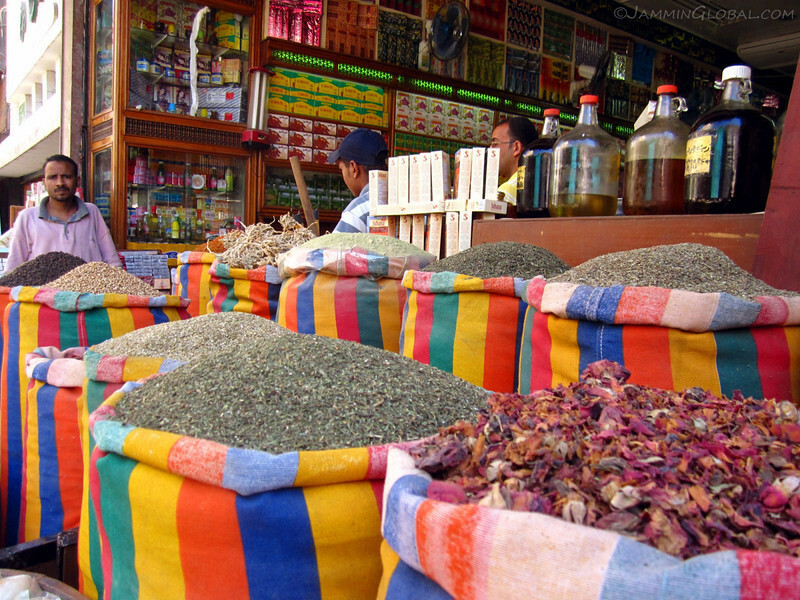 The items on offer ranged from clothes to appliances and my favorite, spices and herbs of all kinds. I think these are different kind of tea leaves, with hibiscus flowers in the foreground. Whatever that is, it looks good. 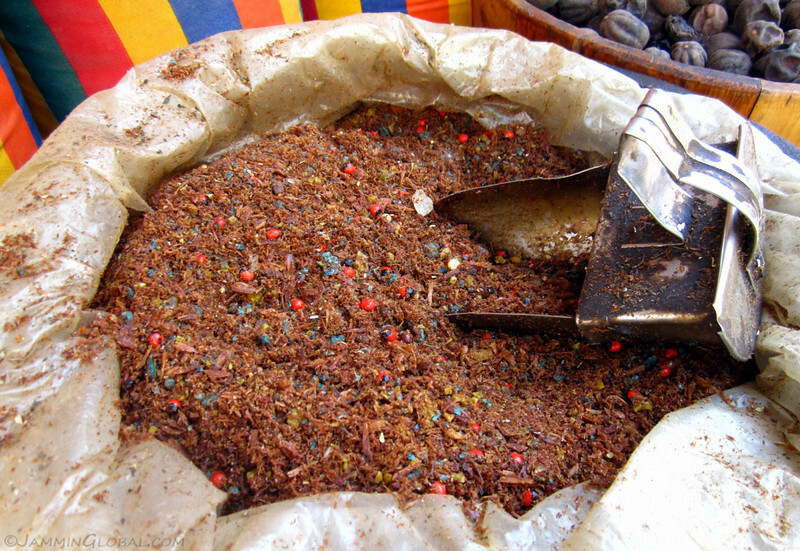 We have something similar in India, which is sweet and taken as a snack. Shops cashing in on nationalist pride after the successful January 25th revolution that brought down Mubarak. Note the props given to Facebook, being central to how protestors organized and communicated during the uprisal. It was a Facebook Page set up by an Egyptian Google employee, Wael Ghonim that was central in uniting the protestors and giving momentum to the movement. Various items from the sea, ranging from huge shells to corals. I wish I spoke more Arabic to understand what they were used for, but probably they’re for decorating and I think some of the stones could be used as a bath scrubber. 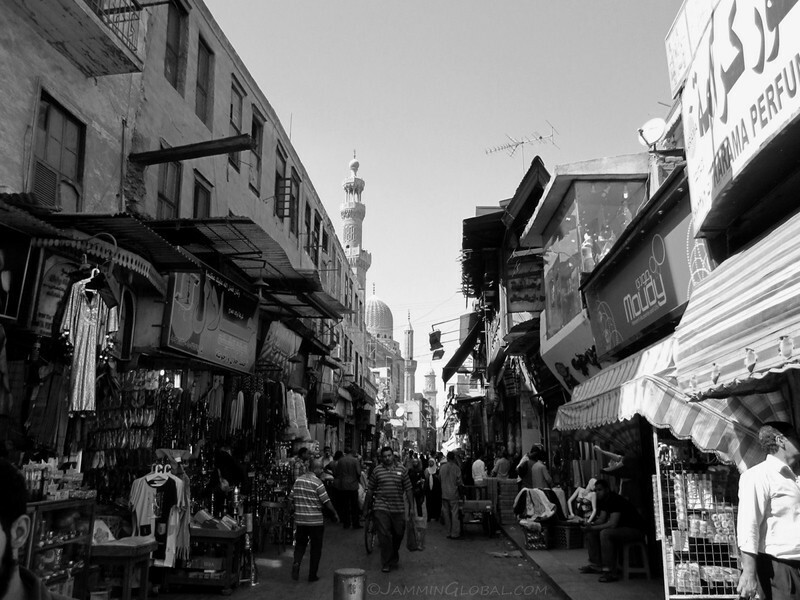 The market lanes were wide near the main roads but got narrower the deeper I went into the maze of Khan el-Khalili. Bird nests, which I think are used as a bath scrubber. 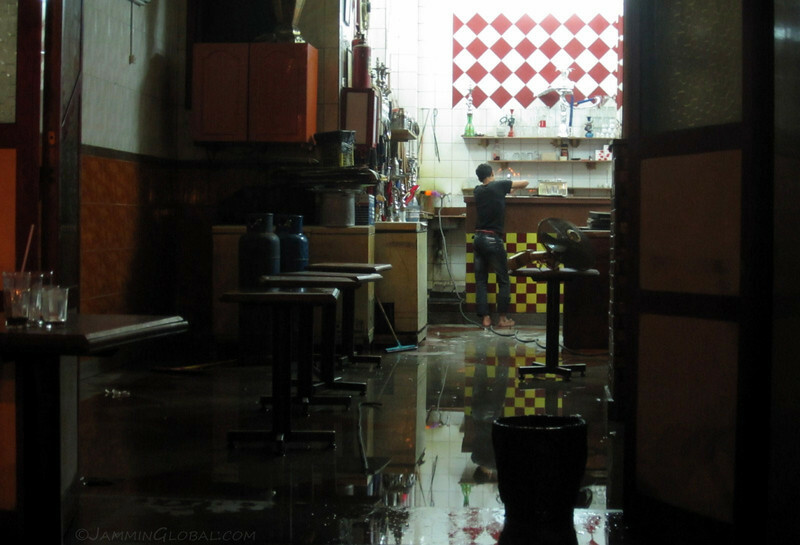 The merchant was constantly pouring water on them to prevent them from drying out. A whole range of spices that I had no idea as to their uses. 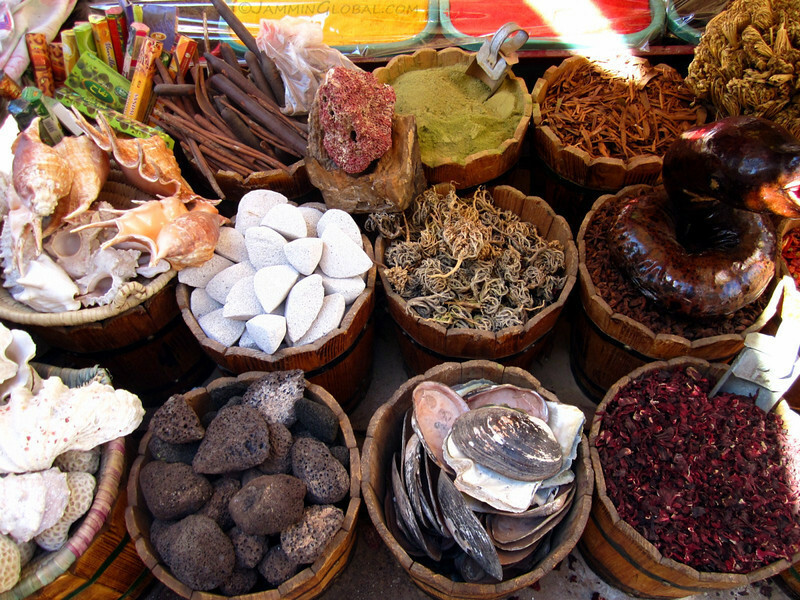 It could be fun living here and trying out different spices every week. 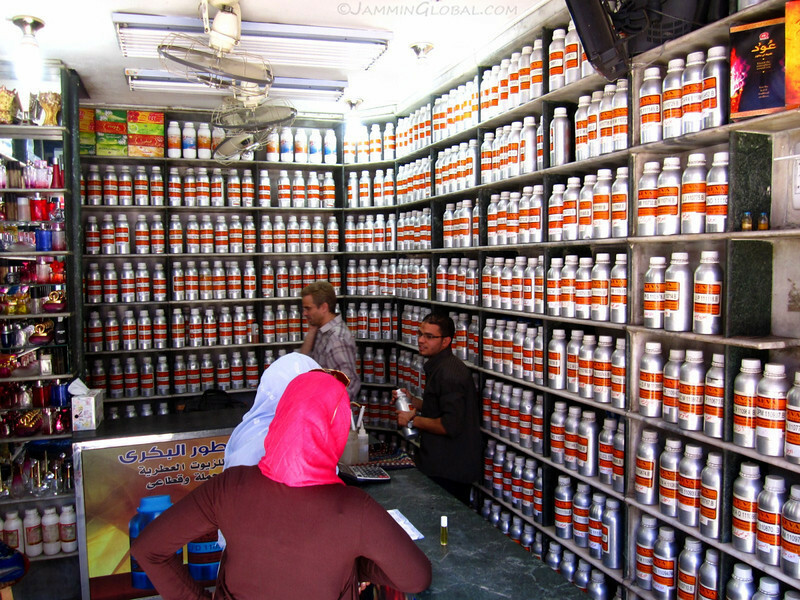 I bought some fresh cumin and coriander powder. This was a strange-looking shop. The shopkeeper said these were all different perfume essences that were blended on the spot to match your needs and pheromones. Talk about a complete custom product and imagine the range of scents available. Walking back to the metro, I noticed this public water dispenser. I was told that this is a way for Muslims to give alms to the needy, Zakat (one of the pillars of Islam), and as water is a precious resource in this desert climate, this act would be much appreciated by the public. Besides the negative impact from fundamentalists, there are a lot of positive acts that Islam instills in society and has done so for centuries. These are trying times for religion and hopefully the good parts survive. 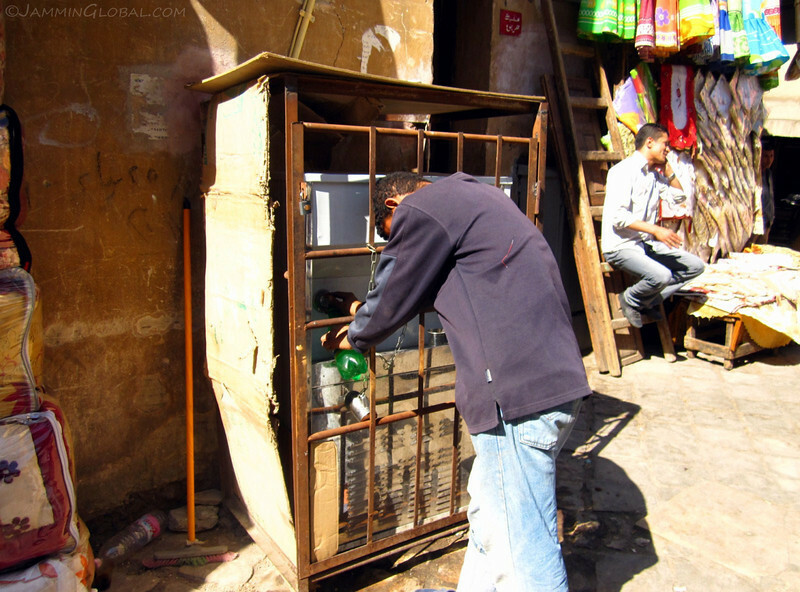 The shops weren’t limited to Khan-el-Khalili, but extended to any available street front. And with each shop trying to get the attention of passers-by, it’s a cacophony of sound that can easily produce a headache. 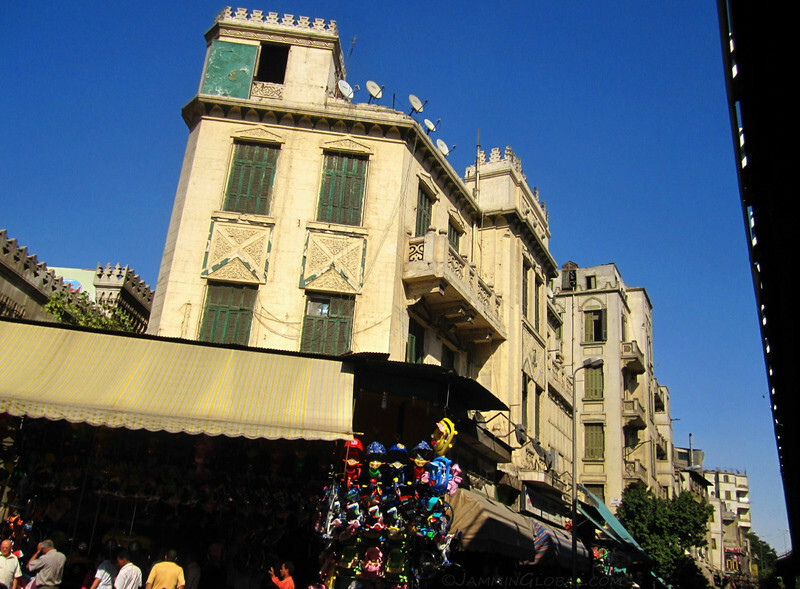 Note the satellite dishes mounted on the roof, beaming in one of myriads of Egyptian soap operas. They love their soaps as much as Latinos. Egypt is a mass-producer of Arabic entertainment for the entire region, comparable to Mexico for Latin America. This is Fabrice and his dog, Conga. I stayed about two weeks with Fab as I had to take care of a few things in the city and thanked him for being so flexible and generous. He’s an expat petroleum engineer from France, but has lived very little of his life there. He was born and brought up in the Congo and Gabon and lived in Venezuela for a while. He said he’s probably heading to Russia next. 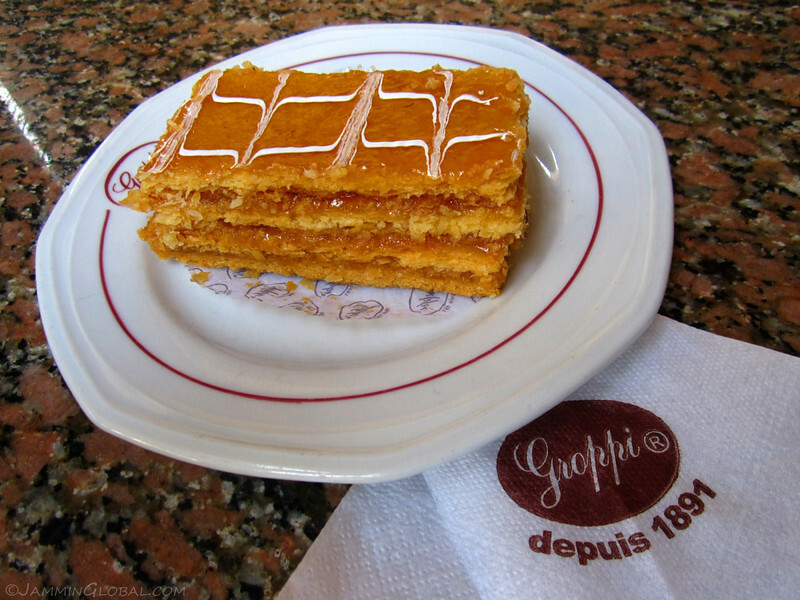 One evening, for dinner, we headed to the local French bakery, La Gourmandise in Maadi, a district in the city catering to many expat tastes. There’s also a German bakery putting out excellent bread. 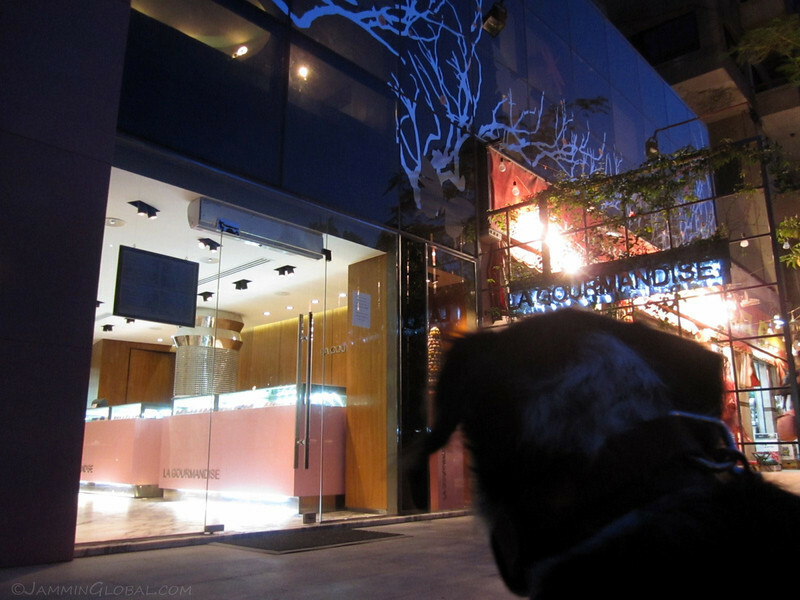 I waited with Conga outside while Fab picked up our orders of quiche. 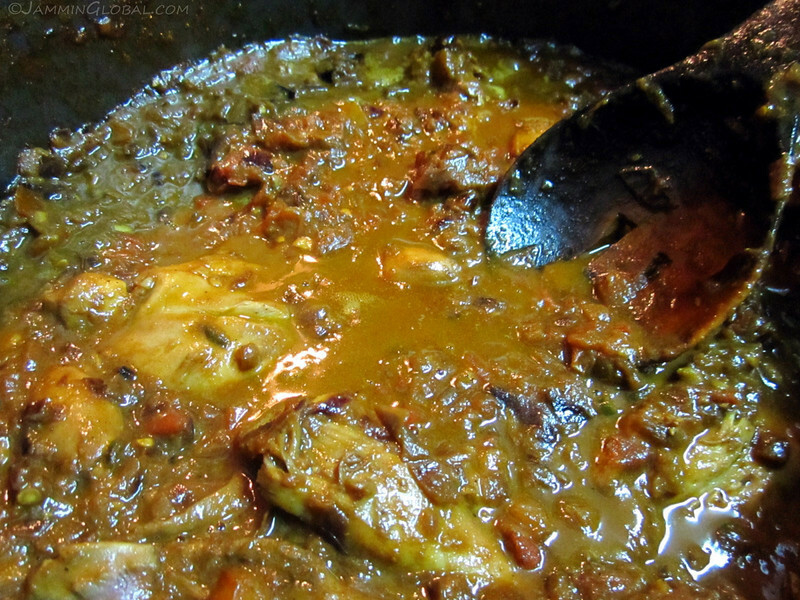 Fab read about my chicken curry on my CouchSurfing profile and asked if I could prepare it for a dinner party. Sure thing. Fab hosts a lot of CouchSurfers and these three were also staying with him at the time. 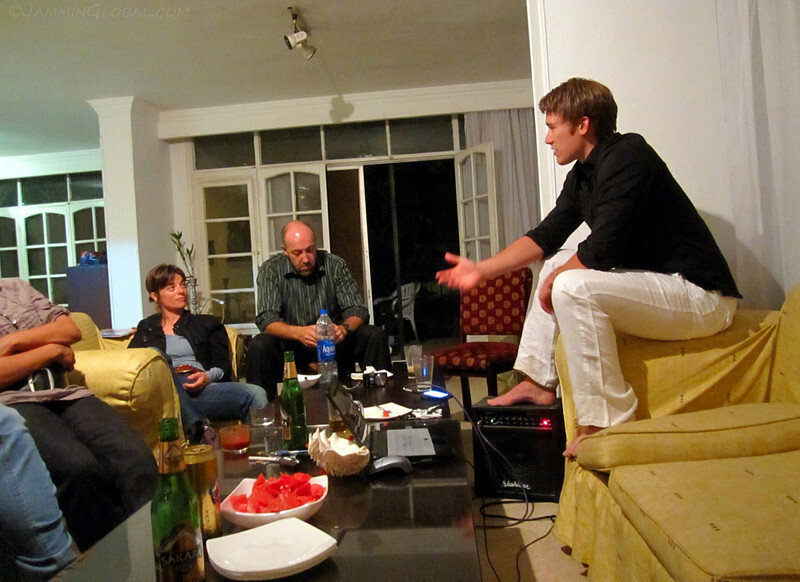 The guy in the white pants is Cody from Vancouver, who just finished a year in Nairobi developing a mobile-based news alert system for violence in the slums (preparing for a possible repeat of the 2007 post-election violence around the next elections in 2012). Since I was planning to spend some time in Nairobi, I picked his brain for info. 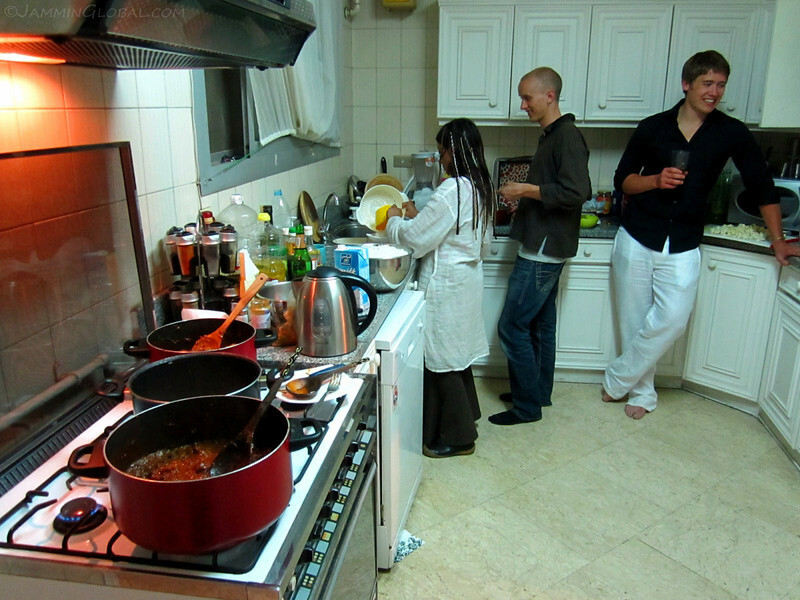 The other two in the kitchen are Yasmin and Daniel, who just arrived on a bus from Jordan where they were volunteering at a Palestinian refugee camp. They were vegetarian, so they prepared their own dish. The chicken curry came out pretty good, but not one of my best attempts. I had to cook for eight people this time, meaning two chickens in two pots. 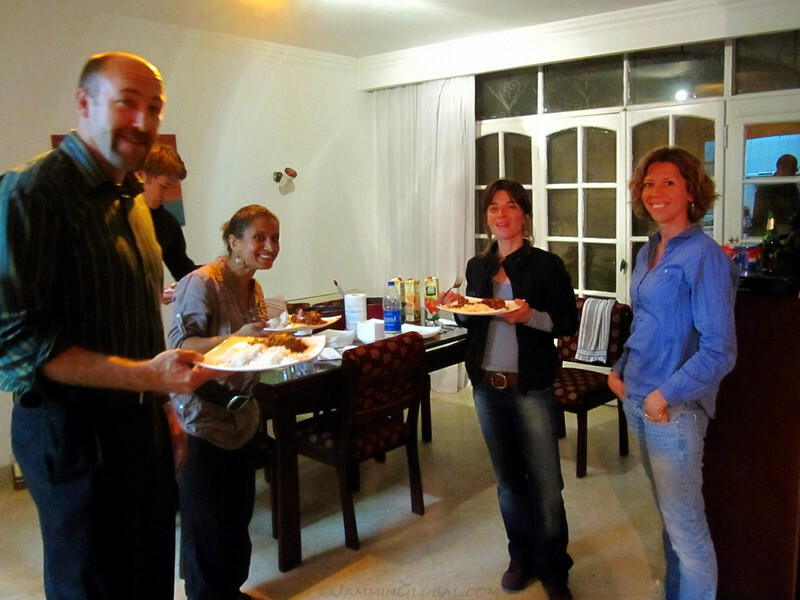 Fab and his dinner guests happy to get their hands on some authentic Indian curry. 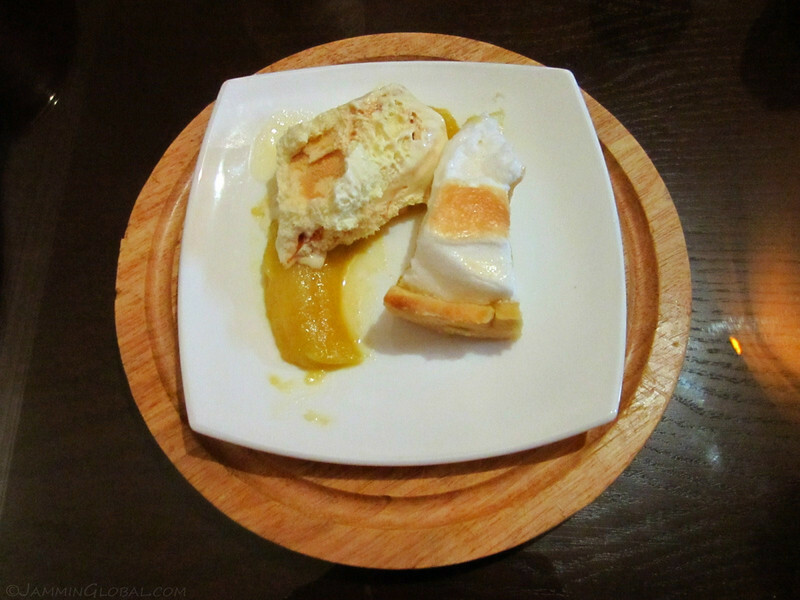 Being French, Fab is a cook himself and prepared this for dessert, which is a slice of meringue pie with a grilled banana topped with ice cream. Yum! After dinner conversation and Cody is briefing everyone on what he’s going to pursue when he gets back home, namely, being a consciousness counselor. It’s a very small field, but basically he’ll be training high profile individuals (sportsmen, politicians, actors, etc.) on how to think better to perform the best in their job. He’s a very deep thinker and an articulate speaker. We had many interesting conversations and I wished him luck in training minds and raising awareness. 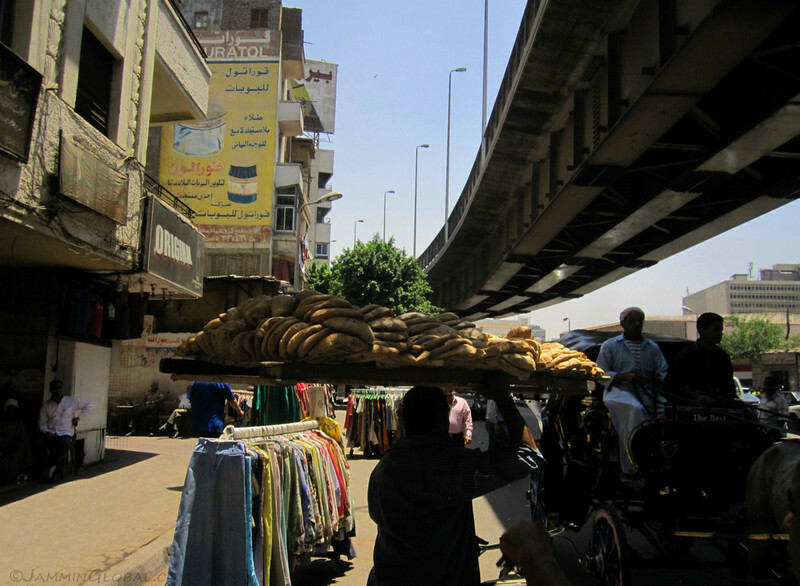 In my first few days in Cairo, I saw the many faces of this large city, spanning from images of its recent revolution to old souks to upscale neighborhoods. There are still many more faces of this city and I’ll be exploring some of those in the upcoming installments. Those cats look like Egyptian Mau. By the way, loving your journal of beautiful pictures and descriptions on them. 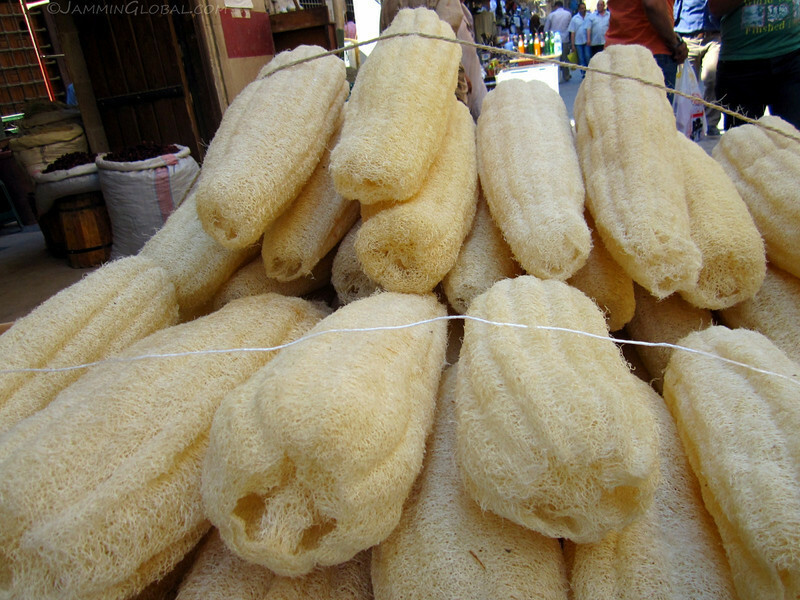 ooops, supposed to be: _as a sponge or a bath scrubber_ , of course. (Sorry, I cannot edit my posts).